Problem: How does a company drive consumers to its mobile app? Solution: Use OOH to increase awareness and create touchpoints for interaction with the brand. 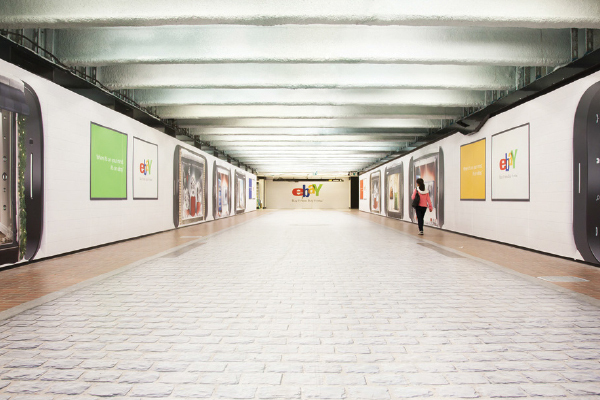 With brand consideration and perception in decline and directly tied to transaction volume and sales, eBay needed a creative strategy for an integrated campaign to lift shopping consideration by aligning perceptions of eBay with the reality of the new eBay. Thus, the campaign was born: When it’s on your mind, it’s on eBay. 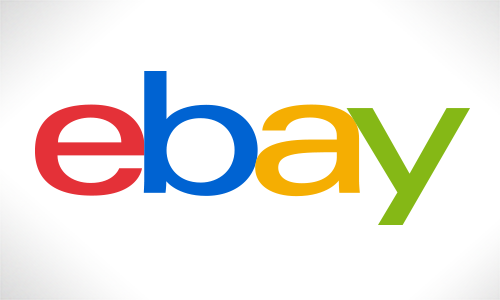 With an amazing selection of new items available now, eBay had transformed from an auction site into the ultimate destination for shopping enthusiasts. With a new line of mobile apps to help customers make purchases on the go, eBay was the shopping enthusiast’s ultimate tool. The planning team was tasked with creating an integrated multi-channel campaign that communicated eBay’s mobile purchase capabilities to shopping enthusiasts who value eBay for their unparalleled section across key verticals: fashion, electronics, and auto parts and accessories. The team started with TV and cinema where each spot highlighted different insights into the mind of passionate shoppers across each vertical and how they can use eBay to instantly buy the items they crave. 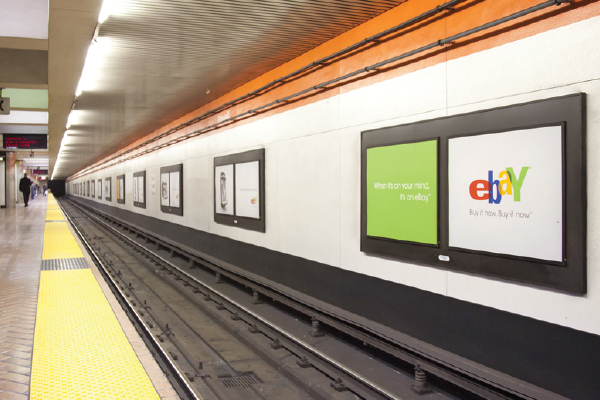 To connect to the on-the-go audience, the team created a multi-format OOH campaign in four key eBay markets. The OOH mix included high frequency street-level media, high impact large-scale landmark inventory, and adjacencies next to key shopping districts. The creative reminded consumers that they could use eBay mobile to shop an enormous selection of fashion, electronics and auto parts anytime and anywhere. And just in time for the holiday season, the agency created the eBay Give-a-Toy Store. 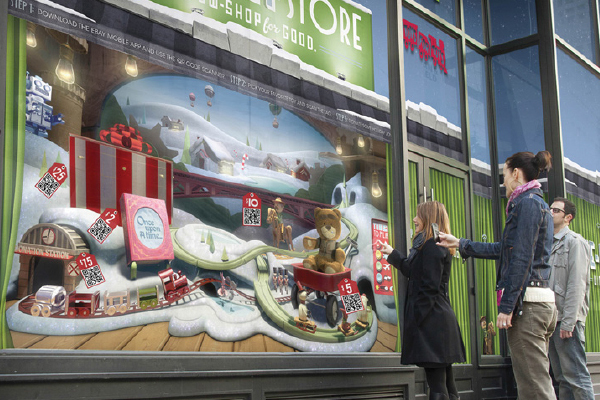 Interactive storefronts in San Francisco and New York allowed holiday shoppers to donate a toy to Toys for Tots using the eBay mobile app to engage in the experience. Visitors to eBay.com and eBay’s Facebook page could also contribute to the charity. Out of Home Formats: Each market distributed a combined 75 showing that targeted shoppers in high traffic shopping and commuter environments with impact bulletins, wallscapes, transit shelters, phone & street kiosks, subway station dioramas & dominations and interactive storefronts. The Give-a-Toy Store went live and began accepting mobile donations on November 1, 2011. 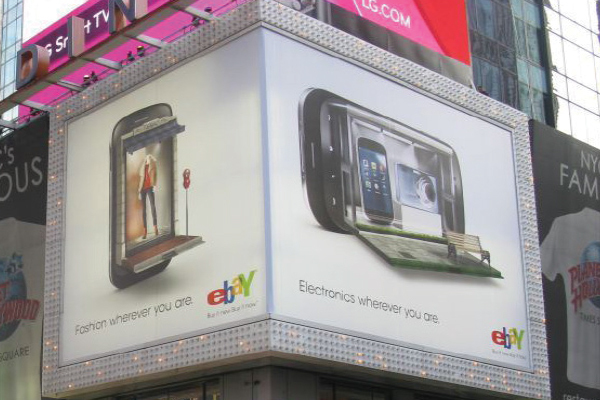 The OOH elements reinforced the immediacy of shopping on eBay, showcasing new items and eBay’s mobile solution front-and-center. To illustrate the ease of use in the mobile platform, executions included QR codes, bar codes and mobile apps, allowing consumers to shop for products on the spot. More importantly, OOH served as a brand reminder in high volume growth markets. Just two short months after the campaign launch, eBay experienced a record holiday shopping season with some eBay merchants reporting a 15% increase in sales on Black Friday. The company also reported a record Cyber Monday, with PayPal seeing a 514% increase in payments made from mobile devices. Metrics showed eBay shoppers purchased 2½ times as many items through the mobile app. eBay also saw its brand awareness, consideration and site traffic increase since the campaign’s launch. In addition to the eBay transit execution winning a Gold OBIE award at the 2012 ceremony, the 2011 holiday season’s Give-a-Toy Store was noted in numerous press outlets, including BusinessWeek, Mashable, the San Francisco Chronicle, InStyle, and Creativity, and was even featured online at AccessHollywood.com.